This peak is #5 on the Height List for Alberta . 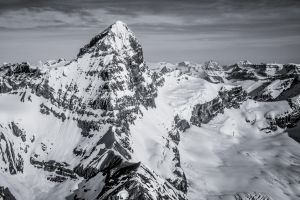 This peak is #6 in Prominence List for Alberta .Located in Banff National Park, about 10 km west of Howse Pass, and 10 km north of the Freshfields Icefields. Both its north and south slopes are drained by different tributaries of the Howse River, a branch of the mighty North Saskatchewan River. One of the great classics of the Rockies, the huge snow plastered face of Mount Forbes dominates the skyline to the south from almost anywhere on the Lyell Icefield. The standard route is a fairly steep climb requiring ropes and crampons, and some parts of the summit ridge are exposed. From the top, one gets a commanding view of hundreds of lower peaks to the north and east. Name Notes: Mount Forbes was named by James Hector of the Palliser Expedition after Professor Edward Forbes (1815-1854). He was Hector's Professor of Natural History at the University of Edinburgh, and a noteable naturalist. One of his expeditions was to the Mediterranean of H.M.S. Beacon , under the command of Captain Graves, part of intervening years being spent in examining the plants and animals off the Isle of Man, towards the description of which appeared, in 1838, a little volume, entitled 'Malacologia Monensis,' and in researches among the Hebrides, Orkneys, and Shetland Islands. Forbes was a pioneer in the field of biogeography and palaeontology.